If you have been prescribed insulin to manage your condition better, know this – you are not alone. About 50% of people with diabetes are prescribed insulin. When used correctly, insulin can be the most effective medication for lowering blood sugar levels. As many as 73% of people with type 2 diabetes are reluctant to start insulin therapy. The reason – fears and false beliefs around insulin therapy1-4. This is the main reason that many patients delay getting the right treatment. Recent studies have shown that a lot of people remain above their target blood sugar for years before insulin is administered.1 Considering the myriad benefits of insulin in sugar control, it is important to get the correct information about insulin. This will help address baseless fears as well. In people with type 2 diabetes, insulin is not usually the first line of treatment. It is introduced when the target blood sugar level is not met after lifestyle modifications and medicines. Many people see this as a personal failure. This mindset increases his or her resistance to insulin therapy. Insulin should be seen as a solution to sugar management, and not as a punishment.1 You have to value your future over your past. As many as 40% of people with diabetes, who have not started insulin, believe that insulin is not going to help them.1 As mentioned earlier, insulin is the best sugar-control agent out there. It lowers the risk of long-term diabetes complications and has no significant adverse effects on a person’s quality of life. That is why it is crucial to educate yourself regarding insulin to dispel such false beliefs. About one-fourth of people with diabetes consider taking insulin daily at the prescribed times difficult. There are many insulin regimens; talk to your doctor about different options if you want the schedule to be more flexible. 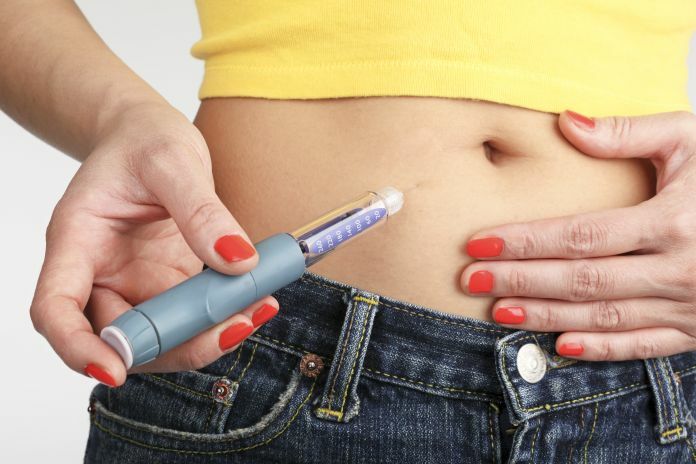 Some people believe that insulin injections are painful or may have a fear of needles itself. 2 But there is an easy solution. Using an insulin pen allows the use of a shorter needle. This considerably reduces the discomfort and make the injections nearly painless. Ask your doctor or a nurse to demonstrate and then do it a few times in front of them. Doing so will help reduce anxiety, which will lower the perception of pain. There are also non-needle alternatives to insulin injections, such as an insulin pump and insulin inhaler. Fear #5: What will people say! Insulin therapy does have a chance of hypoglycemia, but this is true with any medication used to lower blood sugar (such as glimepiride and metformin). There have been many developments with insulin. For example, long-acting varieties reduce the number of injections per day, reducing the chances of hypoglycemia, etc.3 No matter which insulin you use, being informed about insulin therapy, hypoglycemia and using insulin correctly can minimize the chances of hypoglycemia. Weight gain is indeed a side-effect of insulin therapy. However, not everyone taking insulin gains weight. When combined with diet and exercise, your weight can be managed.2 Also, if the prescribed insulin dose isn’t adequate, medications that have a low risk of weight gain can be tried as adjuncts instead of increasing insulin dose. Ask yourself, is anxiety keeping you from getting the right treatment? Think of insulin therapy as just another medication. People who are resistant to taking insulin have something known as psychological insulin resistance. These people find insulin therapy more painful, more complicated, and more unsatisfactory. Therefore, they tend to avoid insulin treatment. But skipping insulin can lead to more complications and more visits to the doctor/hospital. Furthermore, people with depression and/or anxiety are more like to have psychological insulin resistance; they may need the help of psychologists with knowledge of diabetes. Research has consistently shown that almost all aspects of blood sugar control are superior in people who are informed about the disease, the medicines, and the effects of that medicines may have on the disease and the body in general.1-4 Remember that insulin use is more common than you think: 1 in 2 individuals with type 2 diabetes requires insulin within 6 years of diagnosis.3 Some private hospitals in India now have diabetes educators.4 Use their services and get as much information as you can regarding diabetes from them. People who are better informed tend to understand the doctor’s advice better and are more receptive to follow it through. Russell‐Jones D, Pouwer F, Khunti K. Identification of barriers to insulin therapy and approaches to overcoming them. Diabetes, Obesity and Metabolism. 2018;20(3):488-96. 2. Kunt T, Snoek FJ. Barriers to insulin initiation and intensification and how to overcome them. International Journal of Clinical Practice. 2009;63:6-10. 3. Larkin ME, Capasso VA, Chen CL, et al. Measuring psychological insulin resistance. The Diabetes Educator. 2008;34(3):511-7. 4. Jha S, Panda M, Kumar S, et al. Psychological insulin resistance in patients with type 2 diabetes. Journal of the Association of Physicians of India. 2015;63(7):33-9. Next articleDid You Know – Cosmetics Affect Blood Sugar Levels Too?